My PhD research concerns creativity and interaction in trio jazz ensembles. It has a practice based element to it and the research informed by my own trio’s work. Practice based, practice led, or ‘action research’ has become increasingly accepted as a form of academic research and has come to be particularly popular in the last couple of years. It makes sense that a practitioner should lead research their own field and view it from an insiders perspective, and it is with this in mind that I present my first PhD recital. From an audience viewpoint it was little different than any other performance, though I did print a program, usual for classical recitals, not so much for jazz. From a performers perspective it is not much different either except it did feel strange for me having ‘PhD Recital’ at the top of the poster. What was different is how I approached the programming, and the reflection on the performance afterwards. Although jazz is extremely comfortable on the concert stage and has been for many years, there is still a tendancy to feel that it’s ‘natural home’ is the the club or pub. Placing it in a conservatory recital setting does somewhat change the expectations of both the audience and performers. It also affects the repertoire we chose. We played compositions by Uri Caine, Vijay Iyer and Avishai Cohen as well a few original arrangements of standard jazz tunes and traditional material. We are drawing on the work of the main trio innovators, Ahmad Jamal, Oscar Peterson, Bill Evans as well as contemporary developers such as Brad Melhdau and Vijay Iyer. In the end, we hope the audience enjoyed it, (the feedback we received says they did! ), that is still one of the primary motivating factors for making music together. 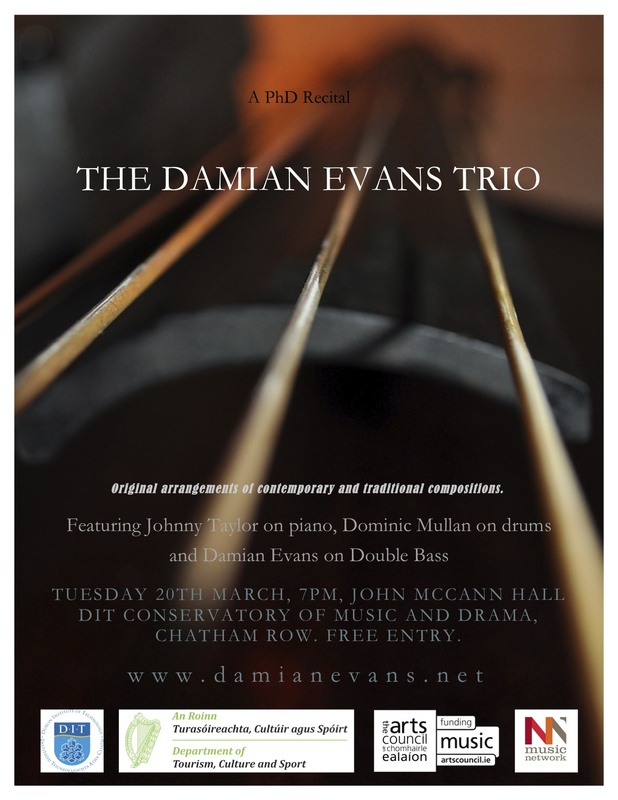 The recital was on Tuesday the 20th March at 7pm at the DIT Conservatory of Music and Drama, Chatham Row, Dublin. Below is a link to a audio clip of Cherokee.